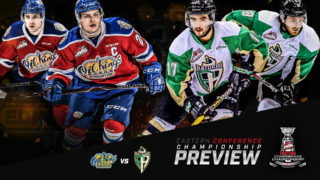 RAIDER REVIEW: The Raiders (40-6-0-2) wrap up their six-game road trip tonight in Cranbrook against the Kootenay ICE (10-30-7-1) at Western Financial Place. 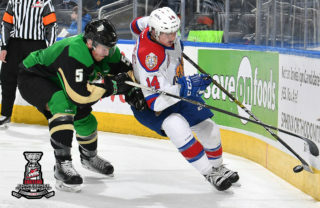 On Thursday night in Langley, the Raiders’ six-game point streak was snapped with a 3-1 loss to the Vancouver Giants. Over that span, the Raiders posted a 5-0-0-1 record. Brayden Pachal scored the Raiders’ lone goal in Thursday night’s loss with Justin Nachbaur and Kaiden Guhle picking up the assists. Davis Koch scored the game-winning goal and added the empty-netter. Ian Scott made 25 saves in the loss for the Raiders. Trent Miner stopped 31 shots to pick up the win. VS. KOOTENAY: This is the third meeting of the year between the Raiders and the ICE. In their last outing, the Raiders downed the ICE 5-1 in Cranbrook. Four Raiders had multi-point nights led by Brett Leason’s goal and two assists. 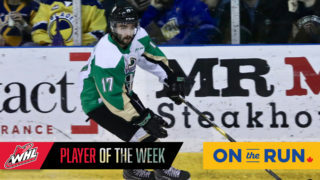 BC’S FINEST: Sean Montgomery led the way offensively for the Raiders during their five-game trek through the BC Division. The overager from Calgary had two goals and three assists over the trip. Montgomery has 20 goals and 25 assists this season and is fourth in team scoring. PACHAL’S POINTS: Captain Brayden Pachal continues to improve on his career offensive bests this season with another goal on Thursday night. The Estevan product has a three-game point streak and points in five of his last six contests. In that span, Pachal has two goals and three assists to bring his season total to 12 goals and 22 in 46 games. OUT OF THE BOX: Cole Fonstad’s penalty at the 10:50 mark of the second period was just the third minor penalty given to the Montreal Canadiens prospect this season. Only two players have few penalty minutes that Fonstad’s six this season – Sean Montgomery with four and Aliaksei Protas with two. 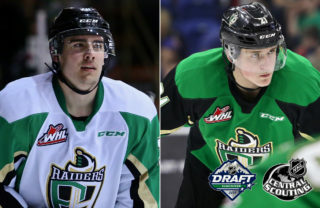 STILL ON TOP: After becoming the first team in the CHL to 40 wins on Tuesday night, the Raiders held onto the top spot in the Kia CHL Top 10 for the 14th consecutive week when the rankings were released on Thursday afternoon. 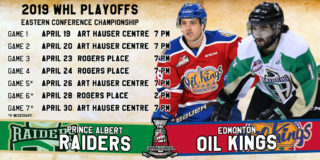 NEXT UP: The return to the Art Hauser Centre for games against the Edmonton Oil Kings and Moose Jaw Warriors on Friday and Saturday, respectively. 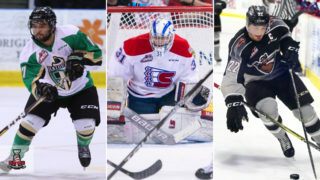 Both games start at 7 p.m. Saturday’s game is the Raiders’ WHL Suits Up with Don Cherry to Promote Organ Donation – Presented by RE/MAX Night. The team will be wearing special Don Chery-themed jerseys that night. Tickets are available at raiderhockey.com and the Raider Office.